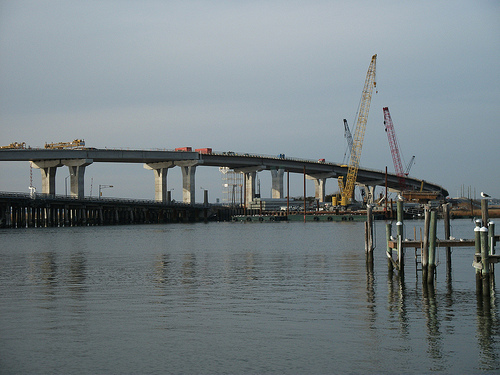 NJDOT's 2012 budget proposal allocates the largest share in a decade to road and bridge expansion programs. Photo by dougtone. The Tri-State Transportation Campaign (TSTC), a nonprofit dedicated to reducing car dependency in New York, New Jersey and Connecticut, released a new analysis of the New Jersey Department of Transportation’s (NJDOT) proposed Capital Program for the fiscal year 2012. According to the analysis, the capital program dedicates its largest share of spending—44 percent—to maintenance and repair projects, and it allocates a higher percentage than it has in the last decade—11 percent—to highway and bridge expansion programs. The agency allocated 8.9 percent for road expansion in 2011 and 3.6 percent in 2009. Since 2004, road expansion spending remained near 5 percent of the agency’s budget. Kate Slevin, executive director of TSTC, expressed concern over the funding devoted to expansion programs, especially as it relates to the future of urban development. “The analysis makes us concerned the NJDOT is taking on too many new road widening projects that it cannot afford, and moving away from smart transportation policy,” she said in a press release. Although TSTC was disappointed in NJDOT’s capital allocation, the organization praised the agency for increasing spending on biking and walking projects. Funding for alternative modes of transit now makes up 3 percent of NJDOT’s overall budget. Recommit to the fix-it-first policy mandated in 2000 to reduce the backlog of deficit roads and bridges by half as the state approves the Transportation Capital Program this year. Take a hard look at proposed road expansion projects and call off projects that will not offer sustainable congestion relief. If the state could not afford the Access to the Region’s Core tunnel project, it cannot afford paying for road expansion projects that do little to reduce traffic congestion. Create a consistent fix-it-first policy among all state transportation agencies, including NJDOT and the New Jersey Turnpike Authority. Restore and increase funding for the state’s smart growth programs to ensure continued progress on these initiatives. Dedicate at least 1 million annually to NJ Transit Village program and the Centers of Place program. Launch a new round of NJ FIT projects that help towns plan for the future. Continue to fund bicycle and pedestrian projects, targeting financial support to places with the highest number of pedestrian and bicyclist injuries and deaths. Restore funding to the Safe Routes to Transit program to at least $1 million annually. Use money previously earmarked for Access to the Region’s Core for its intended purpose of improving the cross-Hudson commute. Find new sources of revenue. The proposed capital program relies on $1.8 billion in transfers from the state’s General Fund over five years, revenues that presently do not exist. For more information, you can access TSTC’s report here.